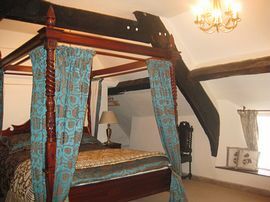 Betsy Cottage is a Medieval Grade II listed cottage, which has recently been lovingly restored. 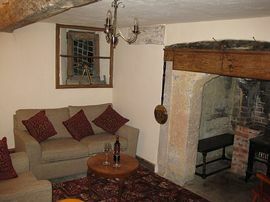 The ancient beams and flagstone floors retain the authentic character and charm of this peaceful and romantic retreat. 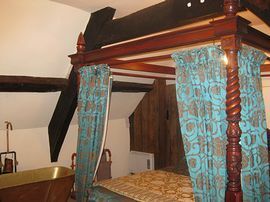 The large bedroom has an ornate four poster bed, enveloped in rich drapes. To add to the cottage's appeal there is an antique copper bath in the bedroom. The living room has a stunning Inglenook fireplace with a Victorian kitchen range. There is also a sofa and armchair, table and chairs, rocking chair, TV with DVD and an I-Pod docking station. The small kitchen has a butler sink, mini-oven with 2 hobs, microwave, kettle, toaster and fridge with freezer compartment. Glastonbury is a 5min drive away, as is Street with its outlet shopping at Clarks Village. Wells is 20mins and Bath and Bristol 50mins drive away. 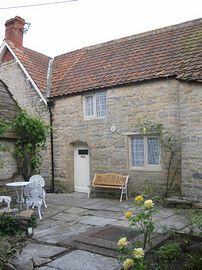 The cottage is located in the heart of the conservation village of Butleigh; a charming little village tucked away at the head of the Somerset Levels, an Area Of Outstanding Natural Beauty perfect for country walks. The friendly local pub, serving traditional fayre, is 5 mins walk away. Please note: steep cottage stairs may be unsuitable for infirm. 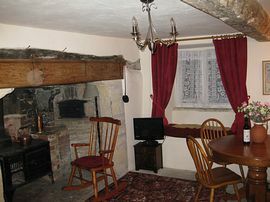 Medieval Grade II Listed Cottage, stunning character features. Peaceful location, ideal romantic retreat. Communal courtyard with seating area and BBQ. Local Services: Traditional local Pub with good food and Post Office/village shop. Bus links to Street (home of the Clarks Shopping Village) and Castle Cary (rail link to London and the South West). Once in the village of Butleigh, please come to The Laurels, on the corner of High Street/Chapel Lane, to collect the key. The Laurels is a large house surrounded by laurel hedge and facing down the High Street. The cottage is located within the grounds of The Laurels. Unlimited roadside parking is available and the cottage can be accessed via the iron side-gate next to the double garage. January, February and March: £220 per week. May and June: £230 per week. October, November and December: £220 per week. Available for last minute short breaks, please enquire regarding availability and pricing. If you're booking the cottage for a special occasion please contact us. We would be happy to help, if you wish to pre-arrange some special touches on arrival.